Mechanical engineer Stephen Pakbaz's LEGO version of NASA's Mars Science Laboratory rover Curiosity will be produced as a real LEGO model. NASA's Mars rover Curiosity, which for almost a year has been driving across the Red Planet, will be the next model to roll off LEGO's CUUSOO production line, the toy company announced on Friday (June 14). The Denmark-based LEGO Group chose a fan-built model of the car-size rover to be the next release in its CUUSOO line of building brick toys. CUUSOO, which in Japanese means "imagination" or, as it is sometimes translated, "wish," is a website that invites LEGO fans to share their ideas for new products. Visitors to the website can vote for their favorite model concepts to be considered for the next LEGO CUUSOO set. Fan-submitted models need to collect 10,000 votes before they are reviewed for potential release. The Curiosity rover model qualified in August 2012, just weeks after the real six-wheeled spacecraft landed inside Gale Crater on Mars. 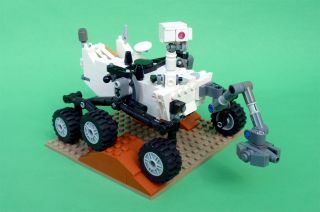 Stephen Pakbaz, who goes by the username "Perijove" on the CUUSOO website, uploaded his idea for the LEGO version of the rover before Curiosity launched to Marsin November 2011. A mechanical engineer, Pakbaz worked at NASA's Jet Propulsion Laboratory in Pasadena, Calif., where he was involved in some of the design and testing of the real spacecraft. "He built the rover and submitted the project to further the educational outreach of the rover's incredible mission and to inspire further public support for space exploration," Courtney said in a video statement that accompanied his blog posting. "My hope was to have a set produced while the real rover was still active on Mars so that the model could help kids learn about the real rover's discoveries as they occurred," Pakbaz told collectSPACE.com in an interview last year. Curiosity, which NASA also refers to as the Mars Science Laboratory, just finished investigations in an area smaller than a football field where it had been working for the past six months. It will soon shift to its distance-driving mode to head for the base of Mount Sharp at the center of Gale Crater. The roughly 5-mile (8 kilometers) trip to the mountain is expected to take about a year. That should give LEGO the time it needs to produce and release Pakbaz's model, though when it will become available remains to be seen. "The final product is still in development," Courtney wrote. "Exact pricing and availability is still being determined, so stay tuned." "We will share that information as soon as we can," he added. Pakbaz designed the model to feature many of the details of the real Mars rover, including its "rocker-bogie" wheel suspension that enables Curiosity to navigate the Martian surface. He separately built a model of the rover's "sky crane" descent stage, which lowered Curiosity down into the crater, although whether that component will make it into the final product is not yet known. The Mars Science Laboratory (MSL) Curiosity rover will be the fifth model in the LEGO CUUSOO line and the second to feature a space theme. In March 2012, LEGO released a model of Japan's Hayabusa asteroid-sampling probe as designed and suggested by LEGO fan Daisuke Okubo. LEGO has also worked with NASA on a series of outreach projects, including flying minifigures to Mars and Jupiter and launching construction sets to the International Space Station. Earlier this month, NASA and LEGO announced a joint design contest for advanced aircraft and spacecraft.